When Matthieu Ricard was in his 20s and studying molecular biology, he traveled to India to meet a Buddhist master he saw in a movie. Soon afterwards, Ricard left behind a promising career in science for a quiet, anonymous life as a Buddhist monk. In the late 1990s, he published “The Monk and the Philosopher,” a dialogue with his father that became an international bestseller. In his latest book, Ricard argues that altruism is the key to solving major world problems like inequality and climate change. He joins us to talk about how consideration for others can solve the challenges of our modern world. Matthieu Ricard Buddhist monk and scientist; international bestselling author of "Happiness: A Guide to Developing Life's Most Important Skill" and "The Monk and the Philosopher"
MS. DIANE REHMThank for joining us. I'm Diane Rehm. When Matthieu Ricard was in his 20s, he left a promising career in cellular genetics to become a Buddhist monk. Ricard lived in relative obscurity until he started writing books on happiness and the meaning of life, which have all become bestsellers. His talks have been viewed by more than 7 million people online. MS. DIANE REHMIn a new book, Ricard argues that altruism and compassion are keys to solving major problems like inequality and climate change. His book is titled, "Altruism: The Power of Compassion To Change Yourself and the World. Matthieu Ricard joins me from the NPR bureau in New York City. You are, as always, invited to be part of the program. Give us a call at 800-433-8850. Send me an email to drshow@wamu.org. Follow us on Facebook or send us a tweet. How wonderful to see you, sir. MR. MATTHIEU RICARDI'm so happy to be in dialogue with you, Diane. REHMThank you. As one of the millions who have watched your TED Talk and I know you've also spoken at Davos, I wonder, truly with humility, what is the best way, the appropriate way to address a Buddhist monk. RICARDDepends in which country. I think, you know, I love simplicity. When people ask me what is my title in the monastery, I say I'm the sweeper. RICARDBecause, you know, it's so much better to be in the most humble position because you cannot fall down. So better take it from the beginning. So Matthieu will be fine in all times and all places. REHMThank you. All right. And to begin with, tell us how you are defining altruism. RICARDSo it is fundamentally a mental state, in intention and a motivation. At some point, in your mind -- of course, not all the time. That would be great. You have a thought that is the main goal and ultimate goal is to benefit someone or to remedy to that person's suffering. So, of course, as much as possible, as much as circumstances allow it, it should be followed by action. RICARDBut imagine that somehow this cannot be possible. It is still altruistic because your intention was clearly and genuinely to help others. Now, if you only look at the behavior, you cannot, for sure, determine if the motivation was altruistic. You could do something extremely beneficial to the person, somewhat to please that person, to gain their favors and possibly to cheat that person. RICARDSo initially, the behavior benefit the person so it may be seen as an altruistic action, but the motivation sort of makes it to be selfish. So it has to be at the motivation level. And it's not that we are always altruists for everyone, but we do have genuine moments of unconditional altruism. REHMAnd it seems to me that at least when I have thought about altruism, it would be a one to one person action, but what you're talking about is global in its reach. RICARDYes. So you see, the global idea, to extend altruism, is more to generate a sense of readiness of benevolence. It's not sort of seeing, you know, infinity of beings and it sort of become a very deluded sort of kind of almost, you know, disincarnated altruism. It is a state of general benevolence, that (unintelligible) you have a benevolent attitude to whoever may come in the field of your attentions. RICARDSo basically, every being that can make the difference between happiness and suffering that comes within your attention sort of gets exposed to that benevolence just as if the sun shines on everyone. When someone comes in the sunlight, he gets the warmth and the light. So it's not, you know, becoming something abstract, sort of diluted, not connected to human beings because, of course, if you have that in your way of being, then when you meet one to one with one person, that's what will come at the surface. REHMSo Matthieu, tell us a bit about your background and how you've reached this point of sweeper in life. RICARDWell, you know, I was fortunate to, you know, grow up in a wonderful sort of a surrounding in France. My father was a philosopher. My mother is 92 years old now, painter. The uncle was an explorer, went around the world on a sailboat, you know, after the second world war. So I was certainly meet at our home very colorful people, people who were excelling in mathematics, in art. I was immense fortune as (unintelligible) very passionate about classical music, to meet Igor Stravinsky when I was 16. What a dream. RICARDBut at the same time, there was something sort of -- I was in a lab with two Nobel Prize of medicine, but there was something that was puzzling me. I didn't know how to articulate that, but later on, when I thought about it, you know, there was all this array of people having different genius and different skills in different domains, but it's hard to relate with human qualities. We take 100 governors, 100 philosopher and you have the same distribution of wonderful people and very difficult people. RICARDSo there was something like that, but what can I take as a model in life to become a good human being. So when I was 20, I saw some documentaries on all the great Tibetan Buddhist masters who had fled Tibet because of the Communist invasion of their country and suddenly I saw that, I thought, whoa. Here are 20 Socrates, 20 St. Francis of Assisi alive. Now, I'm going. So I went. I met them and I was, of course, extremely inspired by the sort of (word?) between what they were teaching and what they were. RICARDThe messenger was the message. So I went back and forth a number of times when I was finishing my PhD and then when time came to do a post-doc, my boss wanted me to go here to United States. I said, look, I'm going to do my post-doc in the Himalayas and I've been doing so for 50 years, of course, not on cellular genetics, but on studying with those masters. RICARDSo for 25 years, I was really, more or less, cut from everything and that is only 1997 when this book was done with my father, Jean-François Revel, boom, I was, again, exposed, you know, to the limelight of the everything else in Europe. REHMTell me how your parents felt when you said, I'm going to the Himalayas to do my post-doc. RICARDYes. No, my mother was not surprised because she had the same inclination that I had and she actually came, a few months after me. She became a Buddhist nun. She did three years retreat so we had the same teachers. Sometimes we were together. Sometimes she was in France. I was there. So that was a great harmony until now. My father, you know, as he said later, every philosopher dreams of having a son who's a scientist. RICARDSo he was very surprised, disappointed. For him, it was -- although, you know, I finished everything I had to do. I finished my PhD. I published a scientific paper. So there was a chapter that was done. But he had the generosity of not making a huge drama, right. I don't like those dramas. We never were at (unintelligible) bad terms ever, but he was a mute catastrophe. You know, he felt very bad and a good friend of his told me later that he came to see him and he cried. RICARDBut, you know, when we, you know, we discussed -- after the book and the media ask him what you felt at that time, he said, you know, Matthieu was 26, someone who can decide what he wants to do with his life. And then, when I saw that he was flourishing in life and so happy there, he came to see me a few times, you know, any parents -- so many parents are in despair because their children don't do well, sort of fall in depression or don't know where to go in life. RICARDSo even is this not the idea that you had for a career, to see someone who's enjoying what he does, well, I think for a parent, it's a good thing. REHMSo what about your colleagues in the mathematical world? What did they think? RICARDSo, you know, some was surprised. My image at (word?) was a (unintelligible) of the Nobel Laureate. He said, you know, knowing you -- I mean, seeing that you are doing quite well -- because I was lucky to find a few things when I was doing my PhD so that sort of speed up my PhD because I found a few interesting things. I was studying the cell division of bacteria. Then he said, well, I became surprised that you decided to go to the Himalayas. RICARDBut here, again, he was very open-minded and generous person and then, when I came back to France on a more regular basis 25 years later, I went several times to see him and he was very happy. We were friends again. I send him my books and so I think it was lucky that everything was quite harmonious, even though, in the beginning, they sort of wondered what I was going to do there. REHMMatthieu Ricard, his brand-new book is titled, "Altruism: The Power of Compassion To Change Yourself and the World." Short break here. We'll be right back. REHMAnd if you've just joined us, Matthieu Ricard is with me. He joins me from the NPR Bureau in New York City. His new book is titled, "Altruism: The Power of Compassion to Change Yourself and the World." I mentioned at the start of the program that I had watched his TED Talk. You, too, can see that TED Talk. We have a link to it at our website drshow.org. Also a link to the talk he made in Davos. And if you'd like to join us now, 800-433-8850. Send us an email to drshow@wamu.org. Matthieu, you said, after you had completed your studies, you did go to the Himalayas. You began learning from Buddhist monks. REHMThe question becomes, how much of altruism is something we have innately, but somehow because of the competition that has become such a strong motivator in this world -- how much of altruism is tamped down because of that? RICARDWell, you see, any of the skills and capacity and potential that we have will be expressed. First, there are different dispositions among people. It's true for everything, physical capacities, why, name it. Yes. So, but, and so, whatever is your base line, wherever you start from, there's a kind of significant margin of enhancing that particular skills. If you attend to it, if you pay attention to it, and somehow if you train in the sense -- not necessarily like you go on a treadmill, although the meditation is -- or mind training is a form of regular exercise of certain qualities -- but simply by over and again mentally being exposed to a certain way of thinking. RICARDSo it's quite sure that if, you know, the idea of competition occupies your mind most of the time, that's going to change what you are. It's going to change your brain through neuroplasticity. It might even change the expression to some genes through ecogenetics. So we actually shaped by thought after thought, emotion after motion, mood after moods, will shape our traits and our predisposition. So, but nothing came, sort of, any of our skills came without training. We didn't -- we are not born learning how to read and write. So, now, the potential for altruism, for solidarity and even cooperation is actually, fortunately, innate in human beings. And that is expected because we are social animals. RICARDSo it's so much as a social animal to cooperate than somehow kick each other's leg all day long. So if you look at the studies which have been done over the last 15, 20 years with very young children, and you see they are sort of unconditional cooperators. That's the first trait that appears. Now, in the lab, if someone drops a pen, the kids jump -- 99 percent of the children will go to pick up the pen. If the experimenter throws it on the floor, they know it's intentional, that he doesn't need help, they don't go. So that's a common trait among young children. RICARDThere's another study who show that they naturally prefer people who behave well to another than those who are a little bit nasty. They do that with puppets, with little bulls with big eyes. One try to climb a slope. Another nice bull come from behind and help it. But there's a green bull coming from the top that pushes down. You hand over those two bulls to the two-years old, 95 percent pick up the nice, helping bull. They could even show that by following the gaze of three-months old babies, that they go -- their eyes go 90 percent to the nice, helping bull. So that tendency is much into us. That's why we must somehow provide the condition in society to allow this natural propensity to cooperate, not to be stifled by a culture of, you know, reckless competition. RICARDAnd if you see the situation of the world today, you could imagine that a certain point in our history, competition was quite good. But when we are soon, maybe 9 billion people, with so many challenges, you know, it's obvious in my mind that the trait that will be most favorable to be able to deal with those challenges will be to cooperate together, to have a sense of solidarity, to have consideration for each other. REHMWe have an email from David in New York, who says, "This is a very nice philosophy. But what can be done about genetics?" He goes on to say, "60 percent of men have the warrior gene, which when activated makes these men wake up angry and go to sleep angry. Some of us still have cave clan genetics." What do you say to that? RICARDWell, you know, the genetic issue has been vastly exaggerated. All my geneticist friend -- and I was studying genetics, I mean, they did the (word?) in genetics -- all said that, you know, this idea of 60 percent, 50 percent, is basically exaggerated. It's probably more in the range of 20 percent. Plus, one of the most vibrant fields of genetics last 20 years is what we call epigenetics. If your genes are not expressed, or if a gene that's supposed to be dormant is now being expressed, you change the blueprint. And it has been shown, for instance, that eight hours of meditation on caring mindfulness does change the expression of genes. RICARD...and structurally. It will be different. REHMAnd yet, you, yourself, say in your book, "Altruism," that selfishness is at the heart of most of the world's problems. Talk about that selfishness. RICARDAh. Well, I certainly paid attention to the fact that selfishness is present. But basically the whole theme of the book is to refute the theory of universal selfishness. It was many people have said -- philosophers, early psychologists, some classical economists -- that we are whatever we do, even it looks altruistic. If you dig deep within, you will find a selfish motivation. So this is really armchair science. There's never been a single sociological, psychological study ever, supporting this hypothesis of universal selfishness. RICARDRather, someone like psychologist Daniel Batson and many others, who spent 20 years of their career to devise very ingenious sort of situations to put people, so that no matter what, even you give easy escape, or different, you know, sort of schemes, there's a significant number of people who will act in altruistic way. So far, there's no single proof for the notion of universal selfishness. So that's a good sign. Of course, as selfishness does exist, it might take extreme forms, which I call institutional selfishness, when you know you are doing harm -- say, like tobacco companies that kill 6 million people every year, in the world, 100 million in the 20th century, as much as two world war -- and who still want to continue their trade, knowing that, you know, they get a license to kill. RICARDSo, knowing that to continue such activity, which is of course present in many quarters of our world, is a form of selfishness. REHMAnd what about economically. What about the economics in this country, where apparently one percent of the population holds the greatest wealth? RICARDSo, that too, big issue, as you mention at the beginning, that the -- for the present, growing inequalities in all the 36 OECD or 36 developed countries in the world that have been increasing for last 30 years, is a major issue. Because inequality detrimental to security, to trust, there's a lower level of education, of health, you know, on average, lower life expectancy -- inequalities are basically deleterious to society. So this is a problem. And how can you solve that? You know, if you go with the classical economic system, like one of the founder of modern economy, Francis Edgeworth, said there's no place for altruism in an economic system. So that's not going to work. RICARDIf you're only about to maximize your personal interests and personal preference, why should you care for poverty in the midst of plenty? Why should you care for the quality of the air, of the ocean, of the environment? So you need what my friend, Dennis Snower, who is a respected economist. He founded the Global Economic Symposium, which is like a mini Davos. He says we need the voice of care along the voice of reason. Because, you know, in our times, maybe if we tell an economy, you know, you should be compassionate. They say, well, of course. As an individual, I can be, but that's not what the economy is about. But who can say today, I don't care about inequalities. I don't care about the environment. That discourse doesn't go anymore. RICARDSo to care -- a caring economics means you step out of that simple, selfish, maximization of personal interest, to be concerned by others. And that's something that we all have the potential for. REHMAnd yet you've heard even public figures say, well, you know, I can't worry today about how 100 years from now somebody's water is going to be affected. RICARDWell, you know, if you have a house and before you leave it to your children, your grandchildren, grand-grandchildren, if you burn the house, that's not very kind. You know, we are now 7 billion people on earth. And somehow we decide the fate of billions and billions of billions of people who don't exist. But they will exist. And they will say, you knew and yet you did nothing. So they are not going to bless us. So what is the solution to that? You know, over the world, over the last six, seven years, when I was doing the research for the book, I met so many wonderful people in all fields of life, you know, -- environmentalists, social workers, politicians, economists, neuroscientists -- and it seemed that there is a very hard time to talk together. RICARDWhen -- environmentalist tell, you know, this going to happen in 60 years. Economists says, yes, but that's not my job. You know, I have to see the balance sheet at the end of the year. So there's this kind of schizophrenic split between the short-term, which is the economy, the mid-term, the quality of life, how people can flourish in one generation, in their lifetime, and then the fate of future generation. So we need a concept. Because those are not bad people. Basically, they have a potential for goodness. They are sometime good family persons and so forth. So we -- I think we'll be happy to work together for a better world. So we need a common concept. And I only see altruism as this unifying concept. REHMAnd you're listening to "The Diane Rehm Show." The question becomes, how do you create an altruistic society. In your Buddhist monastery, presumably, everybody is thinking along the same lines because they do the kind of thoughtful meditation each and every day. You don't have that in such a pluralistic world. RICARDWell, that's right. You know, but the book I wrote is a human being, who happens to be a Buddhist monk, who explored that subject. It is clear, of course, is one of your main goal is to cultivate in yourself, this altruism. You have a better chance to act upon that. And, in fact, now, since 15 years, you know, we started a Foundation for Karuna, which means compassion, which has now achieved 140 projects in Asia, in Nepal, Tibet and India. And now we treat 120,000 patients every year. And we helped 70,000 after the earthquake in Nepal. So we do put it in action. But how can you see more the global picture, of course. RICARDFirst of all, we should not fall in a kind of dark pessimism. You know, Hannah Arendt spoke about the banality of evil about Adolf Eichmann, how people get caught into this escalation of evil. But I think also we can speak of the banality of goodness. We see so many wonderful things. There are a million of NGOs, you know, come grass-root, from bottom-up in society, devoting their time to helping others. If you look at day to day life, there are much more actions of being decent, being kind, being polite, being helpful to each other. If a hundred people cooperate to go to help the elderly or the socially, you know, challenged people, nobody's going to report in the evening news. If one of those person goes to rob a bank, then you're sure he would be in the evening news. RICARDSo there's a kind of distortion of what is actually -- makes the fabric of our daily life, which is much more attuned to, you know, pro-social behavior than the opposite. You know, if 20-years-old person in North America and Europe, has seen 40,000 violent death on TV or film, what that has to do with reality? You know, I have been in many, many challenging places. I was during the Maoist insurgency in Nepal for so many years. I have seen dead people. I've never seen someone being killed under my eyes and certainly not 40,000. So they give you a pensive, quite bleak picture of human nature that doesn't correspond to reality. So first of all, we make -- become some kind of confident that we have that potential. RICARDAnd then we need to change individually because society are made of individuals. So there's many ways to cultivate altruism. Then, finally, we need to find the articulation point to go from individual change to societal change. And that's about the evolution of cultures. Sometimes an idea becomes the idea that seems to be right, you know, ethically, morally. Even 10 percent of people show clearly this idea. Then the sort of critical mass and tipping point in our culture, that's how a culture changes. And that has been studied. And it's a wonderful process. And that's how we could and we should go to a more altruistic society. 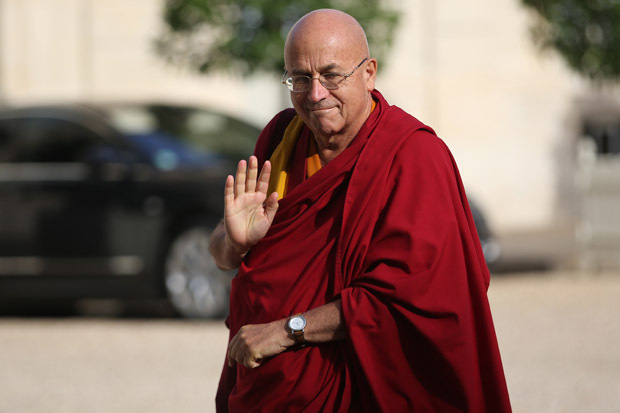 REHMMatthieu Ricard. And after a short break, we're going to open the phones, take your comments, questions, as we speak about how you can use the power of compassion to change yourself and the world. REHMAnd before we open the phones, Matthieu Ricard, I'd like you to talk just a little bit about neuroplasticity and the neuroscience experiments that you've been involved with at Richard Davidson's lab in Madison, Wisconsin. RICARDSo, the idea, you know, there's an initiative called the Mind and Life Institute that has been founded 28 years ago, to bring together top scientists with the Dali Llama, once a year. Sometimes, they meet for five days or two days. So, in 2000, I joined these meetings on destructive emotions. And I met with (unintelligible) , many other luminaries. And then the idea came up of seeing if long term meditators, you know, would there be change, in their brain, when they engage in compassion meditation, in focused attention? RICARDWould there be structural change? Are their brains different? So, I volunteered as an ex-artist. I thought it was a very interesting collaboration. So, now I must have spent 120 hours in MRI machines, in different labs in the US, in Europe. And so, what turned out is that for people who have done long term meditators, I was the first guinea pig, but many others, then of my colleagues, both monks, not monks, men, women, Easterners, Westerners. So, it's not about Tibetan monks. RICARDIt's people who did many years of meditation. It was clear, for instance, when they engage in compassion meditation, there was activation in certain areas of the brain of a magnitude that (unintelligible) said were never reported earlier in neuroscience. And then, you can see your (unintelligible) structural change in the brain. What you might say, okay, so that's neuroplasticity. That's something that was discovered about 20 years ago. Earlier, they thought that the brain, adult brain, would not change. It's so complex that you would mess it up. It turns out that until we die, the brain can change in a big way. RICARDYou know, you can manufacture 30,000 new neurons every month if you train in anything. REHMAnd what you must do for us is to explain compassion meditation. RICARDSo, basically, you know, it's nothing mysterious. Like, we all have moments of unconditional love for someone we love, a child, a close person, even an animal. And we don't have to force ourselves. You know, it flows from our heart. We only wish, may this person be well, be safe, be free from suffering. And if that person suffers that altruistic love become compassion. That is the wish that the cause of suffering may be dispelled. But you know, we think of that quite strongly for half a minute, say, then other things happen. RICARDSomeone comes in the room. We do something, so it goes away. So, if it's like, if you were playing the piano one minute every 15 days, and nothing else, so we never become a pianist player. So, meditation, or training, is simply to generate that in our mind, to think of someone for whom it is easy. You know, like a young child is a good example. And then, cultivate that, nourish that. You know, for more than 45 seconds. You maintain that for five, 10 minutes. 15 minutes. If it declines in quality, you revive it. If you are distracted, you come back to it. RICARDSo, you monitor that so that this becomes a state that you keep on for 10, 15 minutes. If we do that, just how you learn how to juggle or to play the chess or to play the piano, it turns out that you become different, you can see that in your own experience. And neuroscience shows that you don't have to wait for 60,000 hours, but after a few weeks, already, you can see changes clearly happening in the brain. REHMAnd what about changes in behavior? RICARDThat's right. So, (unintelligible) recently did a study, two weeks of 20 minutes a day of compassion meditation and it showed a significant increase of (unintelligible) behavior in those subjects compared to a control group who just did something else. REHMAll right. Let's open the phones to John in Corinth, Vermont. You're on the air. JOHNThank you so much for taking my call. JOHNAnd your guest, Matthieu, you're wonderful. I love just the notion that humanity is benevolent. We are benevolent, and it's wonderful you're trying to unify these fields. I think it's fantastic. I do have a belief that for a person to be genuinely altruistic, they need to be genuinely good with themselves. And that philosophy sort of comes first. Right? The individual notion that they're happy with themselves needs to come first before any notion of altruism can follow. RICARDYes. So, I think you are right. So, you know, in the Western psychology, we have this concept of self-compassion. If people have what is unfortunately happens that people have self hate or they have contempt upon themselves or they devalue themselves and they become either depressed or angry. And they think there is no opportunity for them to be happy. It will be very hard, of course. It will be painful, even, to try to have compassion for others if they don't have compassion for themselves. RICARDSo, in the Buddhist terms, we say, what you say, how does that relate to the way we meditate? So, the first thing, before generating compassion to others, is to at least identify that deep, deep within ourselves, if it was possible, we'd rather not suffer. Nobody wakes up in the morning, thinking, may I suffer the whole day, and if possible, my whole life? Of course, there are people who have been denied happiness due to abuse, due to being object of contempt by their people around them. RICARDAnd it's very hard for them, but somehow, deep within, you know, if you could show them the possibility of happiness, why would they want to suffer forever? So, once you recognize that, then you start valuing that aspiration. It's not selfish to want to be happy, of course, and to flourish in life. Why should that be selfish? You know, your, happiness is just as valuable as anyone's happiness. But then, when you have clearly identified that, then the next step is to say, oh, you know, if others, even if they are confused, even if they don't know they turn their back to happiness. RICARDThey seem to be addicted to the cause of suffering, but deep within, they also would prefer not to suffer. So, if I value that, then I become naturally concerned. So, in that way, gradually you can extend that concern for others. REHMBut now, here's an email from Berkeley in Pennsylvania, who says, I've suffered major depression and anxiety since I was a child. A few years ago, I discovered the tenets of Buddhism. I've found great comfort and inspiration. However, like many sufferers, I have a hard time being altruistic to myself. What advice do you have to help emotionally troubled people who want to help the world and themselves get better? RICARDI think it is, as the former person said as well, it is important to recognize that fundamental aspiration to be free from suffering. If you don't recognize that clearly, and start to push too hard, you know, in helping others, while this is being unresolved within yourself, somehow, it's going to create a tension. You know, I work in the Humanitarian field for the last 15 years. We see, sometimes, people, you know, who have a lot of issues unsolved and come to help and somewhat, at some point, it's too hard. They cannot do anymore. RICARDThey have a sort of burnout. So, it is very healthy to cultivate both at the same time. To discover that, yes, I would rather be happy. Let's find the means for that and that leads you naturally to find, you know, the wish to help others. REHMAnd here's an email from Sam, who says, when I try to meditate, I find my thoughts drifting, even when I try to focus on my breathing. Can you offer some tips on how one can control one's thoughts to maintain focus? RICARDYou know, usually, when we start meditating, we say, oh, it seems I have more thoughts than usual. It's not really you have more thoughts, you just become aware of the extent of the catastrophe. I mean, that in fact, thoughts keeps on revolving like a whirlpool from morning until evening. And we have to deal with our mind all day long. Our mind can be our best friend, our worst enemy. So, it's not surprising. Like any skills that we begin to cultivate, that in the beginning, this element of contrived effort, tension and we don't do things so well. RICARDLike, if you learn how to ride a bicycle, you are tense, you are nervous, you don't do it well. With time, and that's why the whole point of meditation is training. With time, exercise. With time, things become natural. We are getting in the flow of attention. So, you do it well and more effortlessly. And that can only come with time. So, the secret is to persevere. If you want to grow a plant in your apartment, you add a little water every day and the plant will grow. If you add a big bucket every month, the plant will die in between. RICARDSo, it's regularity, sort of enthusiasm by seeing, gradually, the result of it. And normally, you should come to a state where the mind is a bit more calm, a bit more clear, a little bit more stable. REHMAll right. To Steve in Rockville, Maryland. You're on the air. STEVEYes, I really appreciate this, because I have a Master's Degree in Sociology from the University of Wisconsin Madison, as it happens. And the subject of my thesis was symbolic altruism. I called it, meaning, doing good by giving money to agencies and organizations that do good. Cause I'm conscious that, for example, saving a drowning person could be just a matter of instinct, running into the water and helping the person. Whereas, giving money, you have to stop and think, what's the best cause? What's the best agency? STEVEYour foundation sounds like a good place to give money. So, I just wonder what you think of what I call symbolic altruism, and that definition, and I can take my answer off the air. RICARDSo, you know, you certainly know the studies conducted by Elizabeth (unintelligible), a colleague in Canada and elsewhere. They studied people who give regularly, you know, even small amounts or people who are big philanthropists. And they looked at in 27 countries, the control well for their social background, education, health and so forth. And they found that people who are in the habit of giving are significantly happier. So, she wrote the paper, in science, which is not a small (unintelligible), saying money doesn't buy happiness, unless given to others. RICARDSo that's a good start. So, it is true. I think, because, you see, you know, some people have argued that if you help others, you feel the warm glow. Some are selfish because I did that and I feel so good. But I firmly believe that if you just hear about that, you say, okay, I'm terribly unhappy. I don't care about others. I'm going to do an act of generosity and wait for the warm glow. That's not going to happen, because the warm glow is when you're genuinely generous and altruistic. REHMAnd you're listening to The Diane Rehm Show. You wrote a book on happiness, but in it, you say that people often confuse happiness with pleasure. Explain the difference. RICARDSo, first of all, there's nothing wrong with pleasure. You know, having a -- taking a hot shower after walking in the mountains, you know, it's bliss, in a way. But pleasure, by nature, depends on circumstances, on time, and it can easily change into neutral and something displeasant. You know, imagine you spent 24 hours in a hot shower. You know, it's not very pleasant. So, and also, if your only goal is to constantly repeat pleasurable sensation, this is more a recipe for exhaustion, not for happiness. RICARDSo, happiness, and also, if it's not shared by others. You know, you could feel intense pleasure at the cost of others suffering somehow. So, happiness is more like a way of being. It comes with a cluster of qualities, including especially altruistic love and compassion, but also inner freedom, that you are not a slave of all your thoughts. Inner sort of resilience, that you know you have the resources to deal with ups and downs of life. So, a way of being, in fact, the more you experience it, instead of exhausting itself like pleasure, the more it deepens, the more it becomes stable. RICARDSo, that's a quite different approach. So, they are not necessarily antagonistic. You know, pleasure can contribute to happiness, but if pleasure is mixed with craving, for instance, that will be detrimental to happiness. That can lead to addiction, for instance. REHMFinally, how do you see altruism affecting global climate change? RICARDWell you see, the question of climate change and in a bigger way, the question of dealing with future generations, the fact that the way we go now, 30 percent of all species will have disappeared from Earth in 2050. The sixth measure extinction, cease the operation of life on Earth. So it's complex, politically, we know how the (unintelligible) have a hard time taking decision on that. Economically, it's complex. It's going to cost much more in 30 years, but it's not the same people who will pay the bill. And it is complex scientifically. RICARDI mean, there's a unanimity about that this is happening, this is human made. But the details is going to be two degrees, four degrees, how it happens. This is complex. But in the end, and what I discovered when I was researching for the book, it comes to a question of altruism verses selfishness. You know, in 100 years, most of us won't be there. So, if we don't care for future generations, there's no environment problem. There's no climate change problem. We don't care. RICARDSo, you know, I love Groucho Marx. And he said, why should I care for future generations? What do they do for me? But you know, as you said at the beginning of your show, some billionaires have been saying the same thing seriously about the rise of the ocean. I don't -- why should I change my behaviors for something that will happen in 100 years? So, this is why altruism is at the heart, having more consideration for future generations, who will be there on Earth. It's at the heart of the issue of environmental change and climate change. REHMDo you believe it can be truly happen in this Western civilization? RICARDIt will. I think there's the voice of reason and the voice of care can help us to achieve that. When you see, oh, it's because of the growth of population, it's not the case. You know, if population grows to nine billion, it will be mostly in Africa, in Asia. But if you look at those who are responsible for climate change, a North American emits 200 times more CO2 than a Tanzanian. So, that's what we should remedy. REHMI wish I had three more hours to talk with you. REHMIt's been wonderful. Thank you so much, Matthieu Ricard. And his new book is titled, "Altruism: The Power of Compassion to Change Yourself and the World." Thank you so much.